Despite significant progress toward controlling HIV/AIDS with combination drug treatments it is still responsible for nearly two million deaths per year. Even with significant attention given to the mechanisms of the virus, its interactions remain somewhat of a mystery while a multitude of mutations further adds to the difficulty. What is known is that HIV-1 cell entry is mediated through interaction of the trimeric envelope glycoprotein (gp120) located on the surface of the virus membrane with receptors on the host cell. It is worth noting that gp120 is the only virus-specific protein on the virus surface and is directly involved in virus-cell attachment. Therefore, gp120 represents an attractive target for developing therapeutics against HIV. It has recently been shown that peptide triazoles act as a novel class of HIV cell entry inhibitors binding to gp120 with nearly nanomolar affinity. They can be chemically synthesized through the use of an azido-proline amino acid during peptide synthesis and have shown the ability to inhibit cell infection from both the R5- and X4-tropic forms of the virus. Molecular dynamics and site-directed mutagenesis analysis indicate that peptide triazole binding overlaps with the CD4 binding pocket in gp120. Furthermore, it was found that the activities of peptide triazoles in Surface Plasmon Resonance (SPR) assays were very sensitive to modifications in two conserved and neighboring hotspot sites within gp1201. 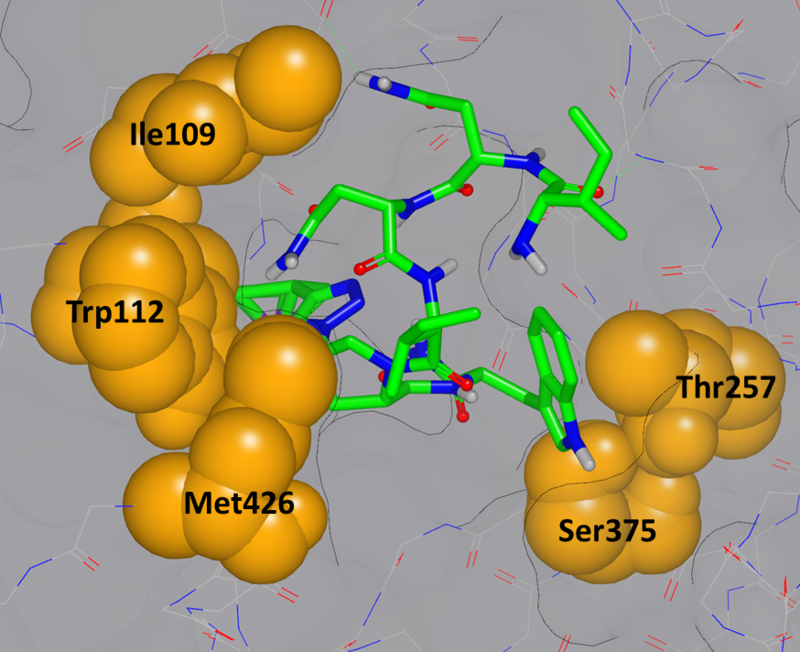 The first hotspot is lined with Thr257/Ser375 residues of gp120 at the interface between the inner and outer domains, while the second hotspot is located primarily within the inner domain cavity by α1 helix Trp112’s side chain indole (Figure 1). It is known that during gp120 transformations which happen during HIV viral infections the β20/21 turn Met426 and the inner domain α1 helix Trp112/Ile109 groups are essential for restructuring the gp120 bridging sheet. Therefore, interaction with the second hotspot region of gp120 illustrates how peptide triazoles can interfere with bridging sheet formation which is essential for co-receptor binding. Dr. Adel Ahmed, a post-doctoral associate in Prof. Irwin Chaiken’s group commented “We believe that the peptide triazole binding model with gp120 from our work will aid in the development of novel drug-like inhibitors by improving our ability to maximize interactions with the protein hot spots”. The Chaiken group recently showed that these peptide triazoles also can cause cell-independent gp120 shedding2. Additionally, peptide triazoles containing a C-terminal cysteine with a free sulfhydryl group were found to cause envelope disruption and release of the p24 capsid protein from the virus lumen. These functions of peptide triazoles cause irreversible inactivation of the virus (Figure 2). Related investigation with multivalent peptide triazoles on gold nanoparticles3, a bifunctional recombinant protein that binds to multiple epitopes on the virus envelope4,5 show that these inhibitors can not only act as potent cell infection inhibitors, but as with peptide triazoles, also inactivate the virus before encountering the cell as shown in Figure 2. Figure 2. Shedding Effect by Peptide Triazoles "Irreversible Inactivation"
In late 2013, the Chaiken group acquired CEM’s Liberty Blue™ Peptide Synthesizer. The system has been used to make not only mini-proteins over 40 residues, but also for post-synthesis cyclization steps. In addition to rapidly speeding up synthesis times, the Liberty Blue has allowed the Chaiken group to efficiently synthesize previously difficult peptides. One such difficult sequence, is the virus-inactivating 16 mer peptide triazole named KR13 (Figure 3). Using the Liberty Blue, the synthetic yield and crude purity were greatly improved which was a major benefit to group research. Dr. Ahmed also noted that the use of DIC/Oxyma for coupling on the Liberty Blue has given the highest purity for his peptides. Dr. Ahmed commented, “We are extremely satisfied with the Liberty Blue and give it a very high recommendation. The system has been very reliable and provides exceptional crude purities with extremely fast synthesis speeds. 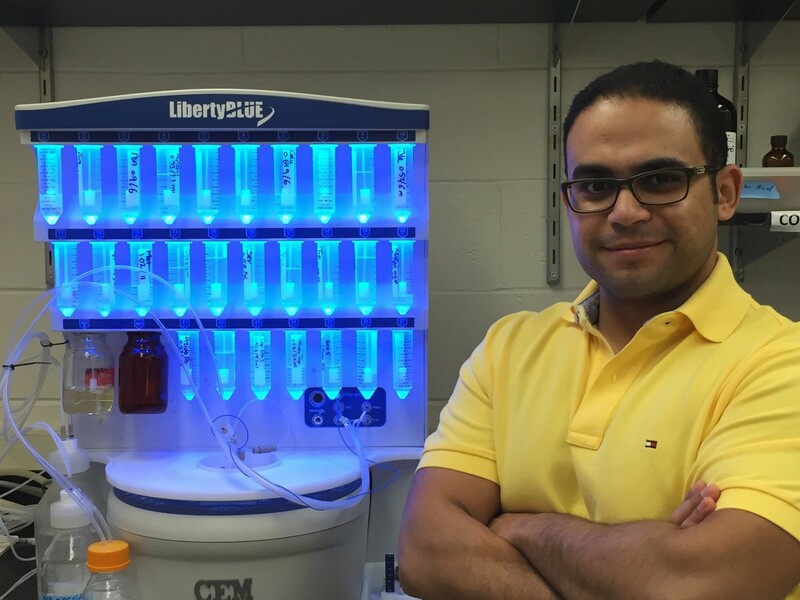 Additionally, the Liberty Blue software is very flexible allowing for easy post-synthesis modifications such as cyclizations.” Dr. Ahmed concluded that the Liberty Blue is an important tool for the synthesis of peptides and peptidomimetics, which have important therapeutic potential against viruses such as HIV. Peptide triazole inactivators of HIV-1: how do they work and what is their potential?